Who? I hear you say.. Well you can forget your Alexa Chungs and your Pixie Geldofs, this woman really is fashion inspiration. Why? Well as well as being a source of insider fashion knowledge that comes from having a job that would make most of us green with envy and a covertable wardrobe to match. It’s her great attitude to life and determination to succeed no matter what, is what really sets her apart from the rest of the fashion pack. New Yorker Jilllian was born with muscular dystrophy, but rather than holding her back this made her more determined to succeed and be noticed in her chosen field. In a world where appearance is everything working in fashion would be a daunting prospect for most. But with her striking blonde hair and make up she makes it clear that she is a fashion force not to be reckoned with. 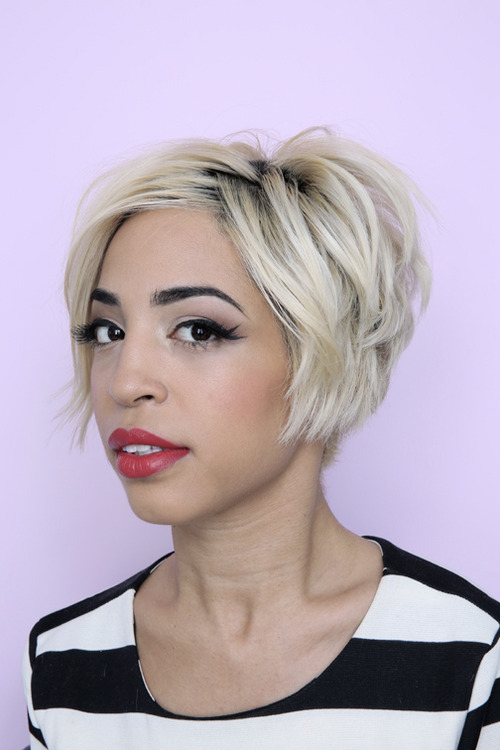 After interning at Allure magazine it seems her career has gone stella; she is currently the Creative Assistant at PMc Magazine, Executive Editorial Assistant for WeTheUrban and Contributing Editor for Beautylish.com! Her own fashion blog www.manufactured1987.com is now one of my new favourite fashion blogs, and is a great source for trends and industry happenings. Check it out! I’d say she is inspiration to us all and is a clear lesson in just going out and getting what you want from life! Little black dress made by the Queen’s dressmaker! I just found your blog and I love it! Great style you have! Wow, she is beautiful and so inspiring that she isn't letting her illness stand in the way of what she wants to achieve.